Laurier alumnus Jeremy Hedges and current student Jared Riddell run an initiative called ‘Fuelling Life’ in which fitness programming is combined with volunteer farming to help feed the needy in the Waterloo community. Hedges, who played varsity rugby at Laurier, was also president of the Laurier Lettermen Club in his final year. The club, which allows varsity athletes the opportunity to give back to the community, led Hedges to volunteer at Cedarbrae Public School in Waterloo. During his time there, he often heard the words “I’m hungry” from students but did not consider their implications. “I’ve always been passionate about people and I wanted to know more about hunger in our communities,” said Hedges. After doing some research, Hedges discovered that one in six Canadians experience hunger, 50 million Americans are "food insecure" and rely on an inadequate food stamp system, and more than two billion people worldwide do not know where their next meal is coming from. Hedges also learned that hunger has a devastating effect on the development of the human brain. He found studies showing that malnourished children from ages zero to three have brain volumes up to 40 per cent smaller than a healthy child. The damage is permanent and more than halves their lifetime earning potential. Hunger, famine, and starvation are not caused by a shortage of food but rather by a shortage of access. This knowledge inspired Hedges to be the change he wanted to see and to encourage others to join him on the journey. Hedges knew that promoting local agriculture could make a difference in his local community and abroad, and he set out to find a way to motivate people to get involved. He hopes to not only raise awareness about hunger, but also to promote the evolution of healthy lifestyles. In just 20 days this concept has gone from idea to reality. The Waterloo-based program already has more than 50 members, and a new chapter has opened in Cambridge out of Riverside Park. Riddell, a plant biology major at Laurier, works as the plant biologist and master gardener for Fuelling Life. Another member of Hedges’ team is Alex Longo, a professional personal trainer with similar passions about people and the environment. She is responsible for the fitness programming of Fuelling Life. For now, Fuelling Life targets all age groups but Hedges and his colleagues plan to open more classes based on varying fitness levels. 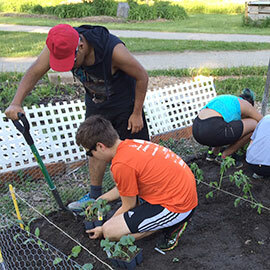 Fuelling Life sessions begin with circuit workouts in Waterloo Park, followed by a jog over to the Sunnydale Community Centre in Waterloo, where participants tend to the program’s organic gardens. Participants will learn about organic farming, the benefits of a healthy diet and exercise routine, and the gratification of giving back to the community. The majority of the harvest will be donated to the Sunnydale Distribution Centre or The Food Bank of Waterloo Region, and the rest will be prepared for group lunches and snacks. Registration for the program is $30 for the entire summer. This fee includes: a Fuelling Life t-shirt, gardening gloves, 45 training sessions (May 17-Sept. 1) and a slideshow progression of the participants and their gardens. The program will run Tuesdays and Thursdays from 6 p.m. to 7 p.m., and Sundays from 9:30 a.m. to 11 a.m.
Fuelling Life will cultivate 1,000 square feet of organic fruit and vegetables for donation to the Food Bank of Waterloo Region. Hedges and his colleagues hope to ‘plant the seed’ for a program that will ‘grow’ across Canada and the world, making nutritious food the norm for everyone.